I used to post my writing only when I was able to take a positive view of whatever situation I might find myself in, but no longer! My standards are changing. 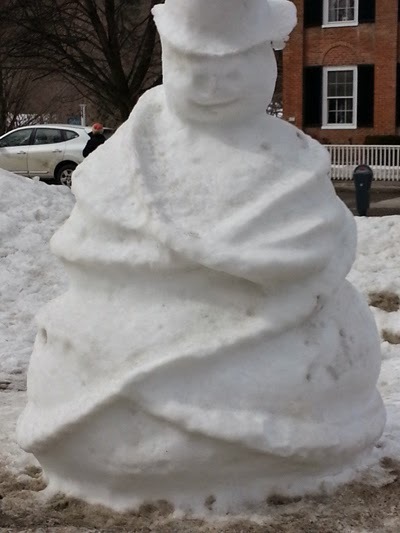 I am a very real and honest person and this means that I have gray days, especially during our Vermont winters when my Pollyanna optimism meets realities and my chin hits the road. 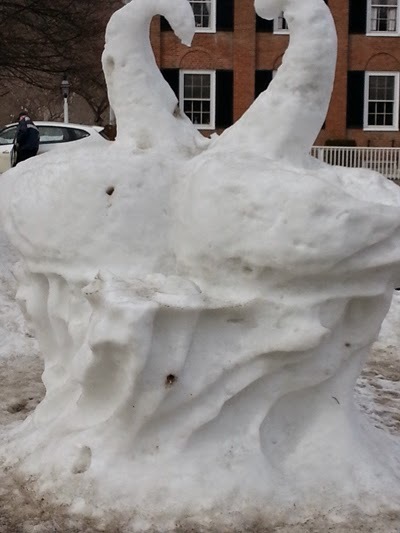 Tired of the endless white and gray days, and uninspired to finish my UFO's, I ask, "Don't we all have these sorts of times?" 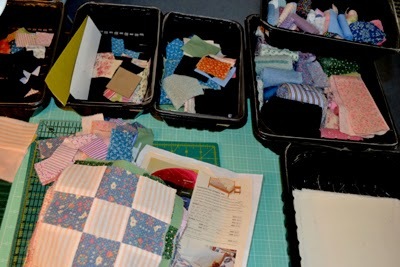 My name is Jane and besides being a "fabric-a-holic", I am also a "control freak". I am the sort of person that needs to feel like I am in control. There are many days when I have to give this desire over to God and accept that I am not in control of my life, the day or even the moment. Even my body seems to be ruled by someone other than me! It is a hard lesson to be sure, especially for someone that likes to see order in the universe and wants to believe on good authority that mind over matter can fix anything. 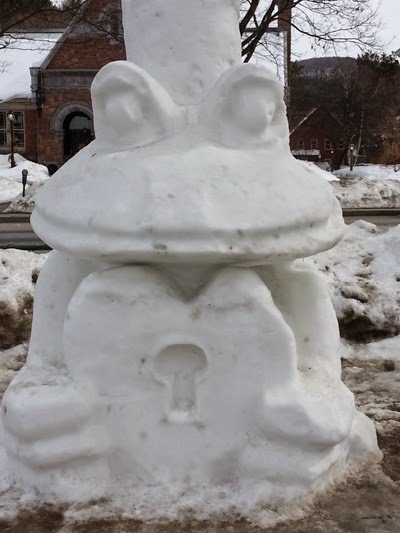 Although I have much faith in God and in what cannot be seen, there are days that are gray, the snow too deep to shovel out and it seems that spring will never come. Marilla Cusper's comment to Anne of Green Gables, when she says, "to despair is to turn away from God" is all too true, but how easy it is to "go there". 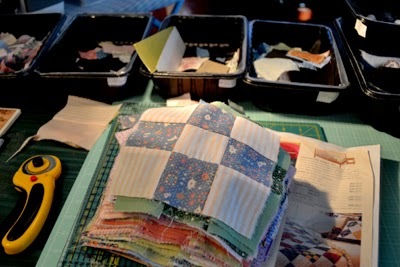 Pin strips, cut strips, pin blocks and stitch-- the makings of a quilt. I used to work a suicide prevention line at a mental hospital. Suicide is truly "a permanent solution to a temporary problem". All of our problems are temporary, and no matter how steady our stream of problems can be, I do believe that with perseverance, prayer, and a bit of "therapy of one sort or another", a different perspective will come and solutions surface to whatever might be ailing us. I do, however, have to remind myself that the world works in God's time and not my own. 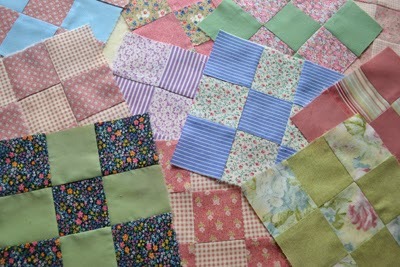 From Scraps to quilt blocks. I used to go on religious retreats every year and during one, I started by confessing that I was experiencing a "desert time" faith-wise. The wise priest hearing my whine, reminded me that "desert times force our roots to grow deeper", but also added, "there is beauty in the desert" and to look for it when I am there! When I was a psychiatric nurse in the days-of-old, a treatment for a depressed patient was a box of tangled yarn. This box was given to the patient with the directions to untangle the yarn and wind it into balls. It is just the sort of task that I love, but when a person is really depressed, more challenge and aggravation heaped on them makes such a task nearly impossible! We knew that the patient was better when they would get angry and throw it back to us with a strong message, "to shove it!!" Cutting squares, counting blocks. Mundane, but therapeutic, activities! Such sorts of therapy were common when behavioral therapy was key, in the days before there was a pill to alter any psychiatric state. It was thought that depression was anger turned inward and activities to facilitate turning a patient's anger outward would be helpful, hence the "tangled yarn therapy". It is interesting to note that research has since shown that working with our hands can help us re-wire our brains, and so while my sewing may seem a "frivolous" activity, for me it is no less than essential. When creativity doesn't spark, doing the mundane, repetitive sorts of tasks seem to be just the thing. 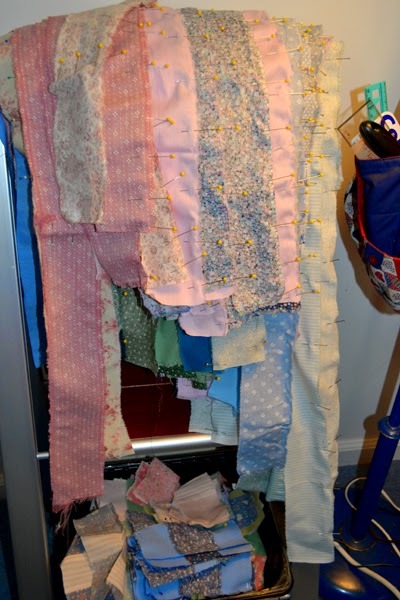 Cutting and pinning, doing the boring and never-ending stitching required in sewing crafts or quilts, knitting or even simply doing the prep work for future days can truly soothe what needs to heal. Physical activity can have a similar effect. House-cleaning-sorts-of-tasks can be a great way to work out frustrations and can prove to enhance a person's feeling of accomplishment and satisfaction as well. What better way to put order to an unsettled mind then forcing yourself to deal with a big disorganized mess! A bit of cutting and organizing. Some serious quilting prep work. I wonder if my Pollyanna optimism wasn't born doing this sort of work when negativity needed to be "teased out" and replaced with hope and positive thinking? A nap can also be a great way to lift mind fog and be a pleasant escape-sort-of-reward for accomplishing such mundane tasks. Sometimes simply "hanging-in by stepping-out" with a nice movie or book can provide needed distraction from pressures that are best solved with a break or a mini-vacation. Whatever your method for lifting the blues, some days remain gray, even if I have untangled the yarn, or cleaned up the mess. Simply waiting for the sun to shine, no matter how long I have to wait, reminds me that it always does come out again. Enough yet for this quilt top, or shall I make two or three? 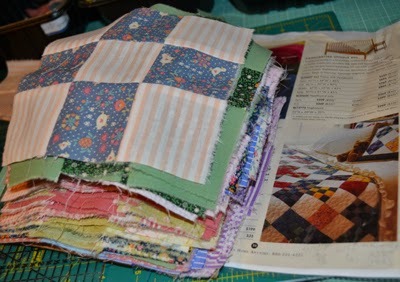 Labels: Winter therapy; Quilting; Quilt Prep work; Cutting/ stitching/ counting; Mundane repetitive work--therapy for the brain!